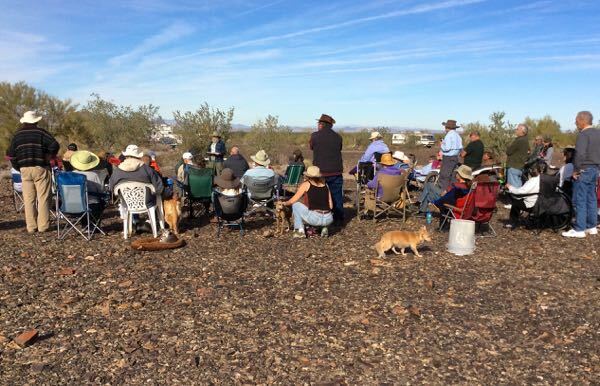 Each year fellow vagabonds gather in the desert outside of Quartzsite at the Rubber Tramp Rendezvous (RTR). 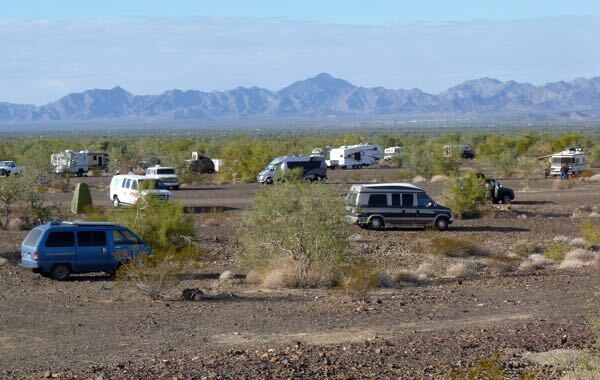 All types of rigs including cars, tents, vans, teardrops, travel trailers, truck campers, classes A B C, and even a homemade gypsy wagon were there. Most days they had classes on various topics related to RVing or frugal living. In the evenings, there were campfires for those wanting to socialize. And, one day each week a group cookout was held with everyone bringing a portion of the meal. The night with chili was especially good, with versions of beef or chicken or vegan, and mild or spicy. Some provided toppings like shredded cheese and sour cream. Crackers, chips and cornbread were also available. Each brought their preferred beverage and a chair. During free times, campers roamed around to visit and to see how others had customized their rigs. One day was designated for ‘Open House’ viewing. Some people went to town for shopping or other business. One night, a few of us went to Silly Al’s for pizza which was fun. 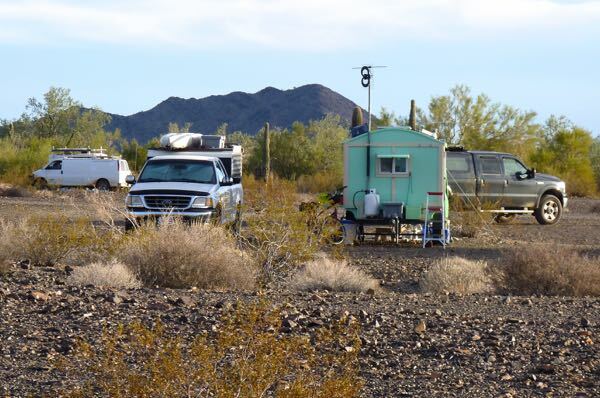 The RTR encampment was about 5 miles out of town and 2 miles from the highway. So, it was fairly private and quiet with desert plants and mountain backdrop. Most rigs were well spaced apart, with some camping together. Many had dogs that roamed free; irritating some campers, but delighting the critters. It was a nice get-together; however, far too many folks for my liking. So, I moved on after a few days. It sounds like things haven’t changed from a couple years ago when I joined the RTR for a while. My favorite was the morning and evening group walks. Like Quartzsite itself, worth experiencing at least once. Large groups are not my preference. But, they say you have to do the Q at least once. I believe once will be enough for me. I spent an afternoon at Q about 3 or 4 years ago walking around the various booths & shops. I drove past the many camping areas and while I’m glad to have seen that much of it, I don’t need to ever see it again. It’s an interesting concept and place though. I will go through one more time heading south. Expect to meet a couple of friends there. That will be more than enough Q for me. Great photos and journal and I may be a lot like you about the crowds. I’ve never felt so alone as when I am in large crowds. And happy hour makes me even more uncomfortable when politics comes up: time to leave. Thanks. 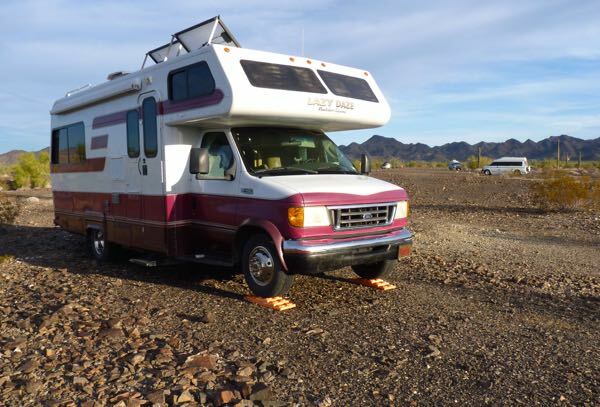 I suspect many solo RVers are more loners than groupies. I’m basically an introvert, and not very social. We joined the RTR last year in Q but parked well away from the group, as we are now with the Lazy Daze. We don’t care to be in the middle of things. We did enjoy the morning and evening walks as it was a nice time to get to know a few people but decided not to go back this year. Hope you stop by and visit with the LD group. Lots of nice people here and walking distance to the Big Tent if you need to pick up anything. I have a couple of friends to meet at Q. And, I will stop in to visit with the LD group. Not sure how long I will hang around though.